Apart from his activity as a design consultant for furniture brands, Carlo Colombo took part in the renovation of public and private showrooms, offices, restaurants and villas; one of the most interesting projects is the Hong Kong Louvre Gallery, a space open to highest quality design items. Today, this renowned designer not only works for Poltrona Frau and Cappellini, but also for several brands such as Alflex, Moroso, Poliform, Varenna, and Flou. In 2004 Colombo received the “Designer of the Year” award in Tokyo. An inspiration for younger talents, this designer helds lectures about industrial design in Italy, Israel, Greece, Portugal, Slovenia, Ukraine, Australia, Russia, England, Brasil and China. 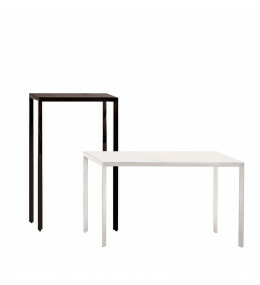 Ministeel Low Tables feature a mirror polished top and chromed metal or matt lacquered base.